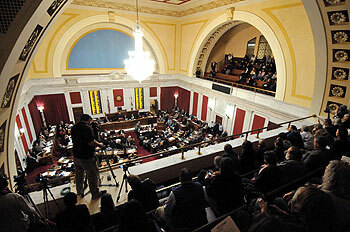 In the Second Regular Session of the 81st Legislature, both chambers are exploring solutions to the growing methamphetamine use and meth lab problem in West Virginia. Within the last year, law enforcement has busted a record high 533 meth labs - almost double the 2012 total of 288 meth lab busts. Currently, medications that contain pseudoephedrine and like substances must be purchased behind a pharmaceutical counter with identification, because of their use in meth production. Supporters say that even though some medications would only be available by prescription, medications without pseudoephedrine and like substances would still be available over-the-counter and treat the same symptoms that medications with pseudoephedrine can. According to Senator Ron Stollings, meth labs can be reduced while also providing the medicine to people who need it. Oregon and Mississippi and parts of Missouri and Tennessee have passed similar legislation and have seen a significant decrease in meth labs within the state. 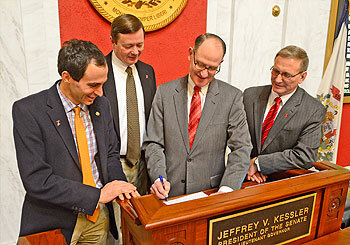 Senate President Kessler has said this legislation is the first step in ending the meth drug problem in the state. Opponents of the bill say that making pseudoephedrine prescription only creates unnecessary obstacles for people who really need it. To purchase a preferred common cold and allergy medicine, people could have to take time out of their day to make additional doctor’s appointments. The medication costs will rise as well due to the added prescription co-pay. A spokeswoman for a group that lobbies for drug manufacturers, Elizabeth Funderburk, said prescriptions for medications are proven not to decrease abuse. Therefore requiring a prescription for medications containing pseudoephedrine wouldn’t stop the abuse of meth. Opponents to the bill reference Oklahoma and Tennessee for an alternative to prescription regulation. Both states recently passed legislation that created a meth offender registry. Offenders convicted of meth related crimes are added to a registry that restricts them from purchasing the medication all together, or requires them to have a prescription. Promoting the development and protection of small businesses has been a focus in the House of Delegates during the 2014 Session. The Small Business Emergency Act was passed through the House early this session and is now being considered in the Senate. More recently, legislation has been introduced that aims to revive, renew and rebuild West Virginia’s business climate and create abundant job opportunities. The West Virginia Project Launchpad Act, or House Bill 4343, would allow the Governor to designate up to 10 geographic areas, maximum of 2,500 acres in size, as economic development launch pads. The selected areas would be home to businesses in the extraction, chemical, and manufacturing industries. The businesses would have to adopt methods of manufacturing or employ cutting edge technology to help create new jobs. The idea is that these improvements would help to ensure a brighter economic future and more job opportunities for the current work force and the youth of West Virginia. Creating and maintaining these good-paying jobs through small business will allow West Virginia to keep bright, young professionals in the state that may otherwise leave. Businesses in designated “Launchpad” locations would be eligible for tax exemptions, deductions, abatements or credit from all local taxes. Interested counties and municipalities may apply to become a “Launchpad” with the WV Department of Commerce. The idea for Project Launchpad was developed by Vision Shared Inc., a nonprofit organization dedicated to bringing together business, labor, government and other diverse interests to develop a strategy that will sustain West Virginia and make the state more economically competitive. Project Launchpad was empowered in 2009 by legislation that gave them the responsibility to make recommendations for economic development in the next generation. House Bill 4343 has passed through the House Small Business, Entrepreneurship & Economic Development Committee and is now being considered by the House Finance Committee. House Bill 4147 would give the Governor the authority to call a state of preparedness. A state of preparedness is before a disaster or a large scale threat - similar to a state of emergency. This bill would also limit a state of preparedness to 30 days and outlines the qualifications of a state of preparedness. House Bill 4186 would add restrictions to issuing a concealed weapons license. This proposal would require that a Sheriff certify that the applicant has been through a National Criminal Background Check System and a concealed weapons license wouldn’t violate any federal provision. House Bill 4236 would create a state-wide system of sexual assault forensic examination service for areas of the state that don’t have close access to a hospital with a sexual assault examination program. This would benefit women who have been sexually assaulted because it would allow them to get an examination done correctly - increasing the probability it could be used in court. House Bill 4284 would create the Pregnant Workers’ Fairness Act, which would require employers to make reasonable accommodations for pregnant women with medical limitations. This bill makes it unlawful for an employer to discriminate against a women’s limitations due to her pregnancy. House Bill 4380 would require the Department of Corrections (DoC) and the Department of Health (DoH) to adhere to the Occupational Health and Safety Act. This bill would make all workplaces under the DoC and the DoH provide safe and healthy working conditions. House Bill 4381 would create a social worker pilot program for pre-kindergarten and elementary schools. One social worker would be assigned to the Title 1 school in a county. If there is more than one Title 1 school in a county, the social worker would be assigned to the school with the lowest test scores. Low test scores are usually associated with lower income areas, so this would ensure social workers are available in areas with more need for their services. House Bill 4382 would create a Legislative Oversight Commission on Energy Worker’s Safety. This proposal would require the oversight of workers in coal and gas industries to ensure that regulations and safety procedures are being followed and a report to the commission stating whether or not regulations need to updated. House Bill 4388 would restrict political contributions during specific times of the year. If passed, this proposal would prohibit members of the legislature from accepting political contributions or favors during the regular or extended legislative session, four days before the regular session and seven days after the regular or extended session. There would also be specific restrictions on times between sessions like interim committee meetings and caucus. House Bill 4433 would require all individuals who receive state or federal aid to undergo a drug test. If they fail the drug test, they are required to undergo treatment and have to pass a second drug test to keep their benefits. An individual who fails the second drug test would have to wait two years and pass a third drug test in order to re-applying for benefits. Senate Bill 32 would authorize the Legislative Auditor to collect sunrise application review fees. Senate Bill 257 would not require a possessor of real property to owe duty of care to a trespasser, unless a common-law right-of-action exists, such as the duty to refrain from willfully or wantonly causing the trespasser injury. The possessor of real property would be able to use justifiable force to force back a trespasser. Senate Bill 267 would ensure that state courts have jurisdiction to prosecute fraudulent or unauthorized uses of purchasing card. If convicted, the person would be guilty of larceny and would be required to restitute all losses. Senate Bill 325 would require the State Fire Marshal to serve at the will and pleasure of the state fire commission. The State Fire Marshal would be exempt from coverage under the classified civil system. Senate Bill 353 would provide the Division of Forestry with the authority to investigate and enforce timber theft violations in state forests. If the value of the illegally cut timber is $25,000 or less, it would be a misdemeanor resulting in up to a year in prison, a $500 fine or both. If the amount exceeds $25,000, it would be a felony resulting in up to three years in in a state correctional facility, a $10,000 fine or both. Senate Bill 380 would redefine “all-terrain and utility terrain vehicles.” “All-terrain vehicle” would be any motor vehicle designed to travel off-highway and on more than three low-pressure or non-highway tires. They would be 50 inches or less wide and be intended to be used by a single operator or designed by the manufacturer to have seating for each passenger. “Utility terrain vehicles” would have at least four low pressure or non-highway tires designed for off-highway use and be greater than 50 inches in width. Senate Bill 381 would require CPR and the Heimlich maneuver to be taught in public schools once between grades nine and 12 as a requirement for graduation. This would be instructed by emergency medical technicians, paramedics, police officers, firefighters, or representatives of the American Heart Association or the American Red Cross at no cost to the schools. Senate Bill 387 would clarify that authorized law enforcement officers transporting prisoners through West Virginia have lawful custody of the prisoners while in this state. Senate Bill 395 would grant certain subpoena power to the Investigations and Fraud Management Division of the Department of Health and Human Resources to investigate welfare fraud. It would also authorize them to request search warrants, swear to complaint, seek relevant orders from circuit courts, provide access to out-of-state documents, and prohibit disclosure of people under investigation. Senate Bill 405 would require a presiding judge’s permission to release juror qualification forms after the trial is concluded. Senate Bill 408 would entitle inmates in the custody of the commissioner to a timely parole hearing regardless the location. Senate Bill 415 would change the due date of certain county commission tax reports to on or before October 15 of each fiscal year. On February 3rd, concerned citizens gathered in the House Chamber to express their uncertainty in the wake of the recent chemical spill that has tainted the water of 300,000 residents.